Your kindergartner will love exploring all things science this year. To keep them engaged, you can experiment with different month by month science experiments. 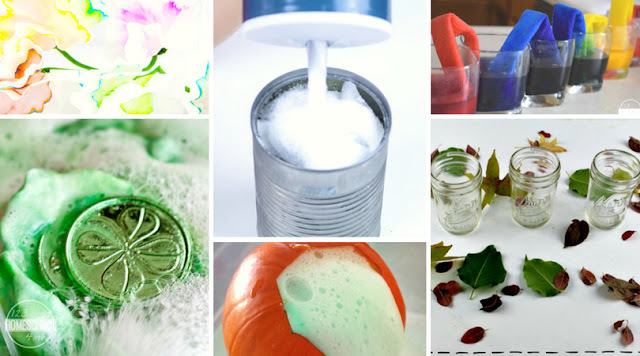 Each month, you’ll have fun with different seasonal, themed science projects that teach your child fun science concepts. It’s easy to teach your kindergarten student about science year round with these month by month science experiments. Simply pick a few science projects to work on each month and have fun! Here are a few science projects you can get started with. Ice, Salt & Temperature – this interesting science project teaches about winter roads. Candy Heart Experiments – Discover how candy hearts dissolve in different compounds with this kindergarten science project. Leprechaun Rocks – This science project is the perfect way to celebrate St. Patrick’s Day this spring. Floating Egg Science Experiment – Did you know you can use science to make eggs float? Here’s how! Earth Science Experiments – Celebrate Earth Day by learning all about the earth! Rainbow Density – You tend to see a lot of rainbows during the spring months. ; use this fun science project to teach about spring rainbows. Rain Cloud Spring Science – This science project will give your kindergartner the opportunity to make a rain cloud. Capillary Action Science Experiment – The trees are budding, making it a great time of year to teach your kindergartner about capillary action. Lego Electricity – Do your kids like building with Lego blocks? They are sure to love this Lego electricity project. Pop Rocks Experiment – Candy and science? Yes please! Kool-Aid Rock Candy – Kool-aid is a staple drink during the summer months. Combine this summer beverage with science by making Kool-Aid rock candy. Why Do Leaves Change Colors – Leaves start to change colors in the fall, so kick off this season with this fun experiment that helps kids understand why they change colors. Colorful Candy Science – What will your child do with all that Halloween candy? Encourage them to use it to learn with this fun candy science experiment. Disney Monsters Inc Inspired Slime Recipe – Celebrate everything creepy and crawly this Halloween with this squishy science project. Mini Pumpkin Volcano – You can study chemical reactions while also celebrating fall with this pumpkin volcano. Homemade Butter Science Experiment – This tasty science experiment can be a great addition to your Thanksgiving meal. Turkey Thanksgiving Slime Recipe – If your kindergartener loves slime, this is the science project for you! They’ll love making this turkey-themed recipe. Creating Frost – Are you ready for winter? Your kids will be after creating frost with this winter science project. Pine Cone Science – If you take a walk in the woods, you’ll probably see pine cones all over! Collect a few for this science project. We hope these month by month science experiments list will help students get excited about science and learning year round. Make sure you see all our Kindergarten Science Activities!